August 17-19 this year marked the 48th edition of Chmielaki Krasnostawskie, the oldest celebration of brewers and hop-growers in Poland. Beers from Kompania Piwowarska’s portfolio have been winning awards in the consumer competition accompanying the festival for years, and the latest edition brought further distinctions. The list of winners included this year’s novelty from the Książęce brand - Książęce IPA. The jury of the 48th edition of Chmielaki appreciated Beer Specialities from the Książęce brand. 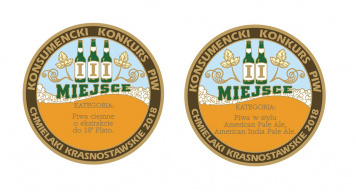 Książęce Ciemne Łagodne was awarded already for the third time, this year with a bronze medal in the “Dark Beers with extract content up to 18° Plato” category. The second award winner is Książęce IPA, the first beer brewed in that style by the brewers from Tyskie Browary Książęce. Książęce IPA received a silver medal in the “American Pale Ale, American India Pale Ale” category. The judges gave high notes to the balanced combination of six types of American hops and two kinds of malt that resulted in a model IPA beer. - We are proud that this year’s novelty from our offer, Książęce IPA, was so well received by the judges. It is yet another success of the Książęce brand, achieved thanks to the work of the experienced brewers from Tyskie Browary Książęce. It is their talent that makes successive variants from the Książęce beer speciality collection win the hearts of Polish beer lovers – sums up Joanna Kwiatkowska, Communications Manager at Kompania Piwowarska. National Celebration of Hop-Growers and Brewers “Chmielaki Krasnostawskie” is the oldest brewing event in Poland, with over 40 years of tradition behind it. The first edition took place on September 11, 1971 as a regional festival. 7 years later, Chemielaki became an event with national reach. Currently, the celebration involves many breweries and thousands of tourists and beer enthusiasts from across Poland and Europe. The consumer competition during 2018 Chmielaki Krasnostawskie saw submissions from over 300 beers in 26 different categories.